The sizes of the moving boxes you use to pack your household items are important. The fewer boxes you end up packing the better, but there are a number of additional concerns. It’s a mistake to pack an extra-large box with books, for example, making it too heavy to carry safely. By estimating how many boxes and what sizes you will need, you can make the packing process more enjoyable for everyone. 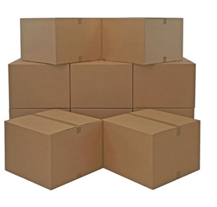 Exact box sizes vary by manufacturer, but they generally fall into small, medium, large, and extra large categories. You may hear these small boxes called “book boxes.” They are ideal for packing small, heavy items or delicate valuables that should not be shipped in the same box with many other pieces. Most of your belongings, including large dishes, framed pictures, and electronics will fit well in medium-sized boxes. They are still easy to carry, even if they end up being fairly heavy when packed. Large art pieces, clothing, lamps, and other relatively light items can be packed together in large boxes. If a large box contains fragile items, make sure to clearly label it so that it will not end up on the bottom of your load. Only very light things like bedding, curtains, and pillows should be packed in extra-large boxes. If they are too heavy, they are impossible to move without running the risk of injury or damage to the items packed inside.